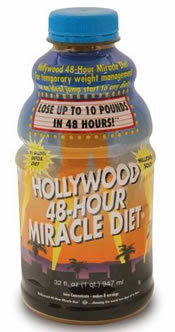 The Hollywood 48 hour miracle diet claims that you will lose 10 pounds in 48 hours. This is a ‘fad’ diet and is not a sustainable weight loss technique. It is essentially a juice fast. However juice fasts and tonics can be very beneficial to your overall health. An essential part of the diet is the Hollywood diet ‘miracle’ juice – a scientifically formulated blend of vitamins, fruits, minerals, antioxidants and essential oils. Ingredients: Filtered Water, Apple, Cranberry, Raspberry, Blueberry, Blackberry and Strawberry Juice concentrates, Xathan Gum, Acai Citrin, Ascorbic Acid Vitamin C, Natural Blueberry Flavor, Niacinamide (Vitamin B3), Panthothenic Acid, Pyridoxine HCl(Vitamin B6), Riboflavin (Vitamin B2), Thiamine Mononitrate (Vitamin B1), Folic Acid, Cyanocobalamin (Vitamin B12), Palmitate Vitamin A, Vitamin D3, Vitamin E.
22 grams of sugar per 4 ounces. Ingredients: Pineapple, Apple and Orange Concentrates, Apricot, Peach and Banana Purees, Palmitate Vitamin A, Vitamin D, Vitamin E, Ascorbic Acid, Vitamin C, Thiamine Mononitrate (Vitamin B), Riboflavin (Vitamin B2), Pyridoxine HCl (Vitamin B6), Cyanocobalamin (Vitamin B12), Niacin, Folic Acid, Panthothenic Acid, and a special blend of Essential Oils, Bergamot, Tangerine, Lemon and Orange. The purpose of the Hollywood Miracle Diet formulation is to detoxify and cleanse your system, and to assist in restoration of biochemical and mineral balance, which lasts for either 24 or 48 hours. They say that dieters should lose up to 5 pounds in 24 hours or 10 pounds in 48 hours. They encourage dieters to get more from the Hollywood Diet by following their full 30 day program for a total of 30 Days. Follow the Hollywood 24 or 48 Hour Miracle Diet for 1 or 2 days. Detoxify and rejuvenate your body while losing unnecessary pounds. Replace one meal a day with the Hollywood Daily Miracle Diet made from 16 fruits and vegetables. For best results, replace dinner meal with the Hollywood Daily Miracle Diet. Refrain from red meat, dairy, sugar, diet sodas, salty snacks, fatty foods and sweets. Take Hollywood Meta Miracle (ephedrine free) twice daily to turbo-charge your metabolism, increase energy, and control hunger. It is important to eat a healthy breakfast, sensible lunch and snack on raw vegetables and fresh fruit. Do not eat after 6 pm. Take Hollywood Mega Miracle 75 twice daily to provide your body with proper nutritional supplements. For best results, walk briskly for at least 30 minutes daily. Repeat the Hollywood 24 or 48 Hour Miracle Diet regularly, either every weekend or once a month. Your body will be thankful for the time off! The Hollywood Cookie Diet is easy to follow. Simply eat up to four cookies throughout the day and have a sensible 600-800 calorie dinner. This method is very effective for weight loss because it works on the principle of portion control and calorie restriction. Each cookie provides 140-150 calories, 3-4 grams of fiber and 5 grams of protein. The dietary fiber they contain is said to act as a natural appetite suppressant. The cookies are available in different flavors including lemon, oatmeal raisin, cranberry orange and chocolate chip. Certain foods that are high in fat, carbohydrates and calories are recommended to be avoided or limited as much as possible including bread and pasta made with white flour, butter, margarine, fast food, fried food, potato chips, soft drinks, sugar, white rice and processed foods. Dieters are encouraged to weigh themselves once a week and to use other methods of assessing their progress such as taking body measurements with a tape measure or “before” and “after” pictures. 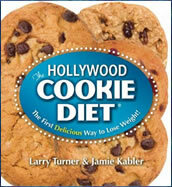 The Hollywood Cookie Diet book also includes tips for maintaining motivation and a selection of recipes. The Hollywood Cookie Diet book retails at $5.99. A box of 12 Hollywood Diet Cookies costs $19.99, which is enough for three days supply. Special offers are available if you buy at least 3 boxes of cookies at a time. Like most rapid weight loss diets – it can be a loss of water and toxins rather than fat. If you are looking for a quick and easy answer to weight loss then this is not it. BUT, if you are looking for a good tonic, detoxifying, and cleansing routine then the Hollywood Diet Miracle Juice may be helpful. Any weight loss is more of a side-effect. However, following the Hollywood Diet 30 day plan and the meal replacement eating plan could encourage more weight loss. We still think there are probably better, healthier ways to lose weight than the Hollywood Miracle Diet. i think it might work but im not so sure yet… but i dont need to get a diet im reserching for heath class so peace out everyone!!! I like this diet! It does work for a short term fix. If you are looking to lose weight permanently only giet an excercise will work. I use this to kick start my weight loss, start eating healthy, running and then use this for a detox . Since you lose weight it keeps you motivated. I lost about 7 pound on it. I’m 5’6 and now 123 instead of 130.